It’s true. Hardware is like jewelry. 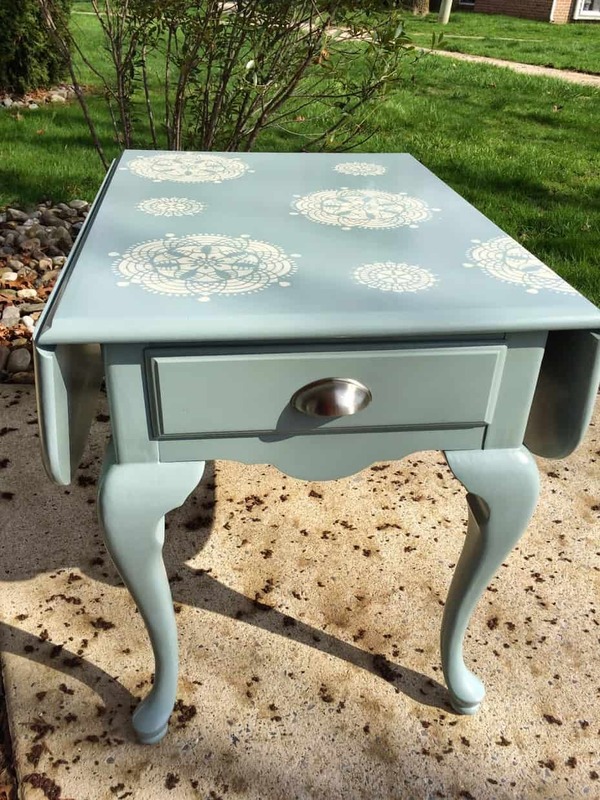 It adds the finishing touch of bling to any furniture piece. There are lots of different kinds of hardware too. 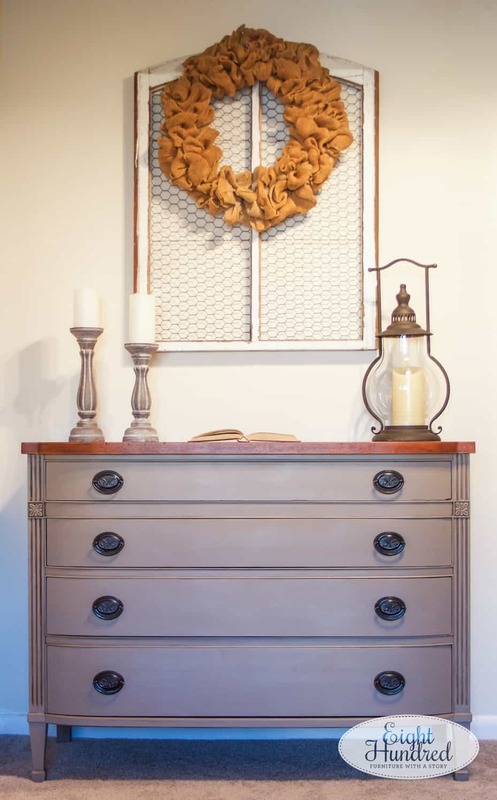 There’s a whole world of options, styles, metals, finishes, materials, etc. Just bear with me. We furniture folk get excited about hardware. These little guys are called bin pulls or cup pulls. 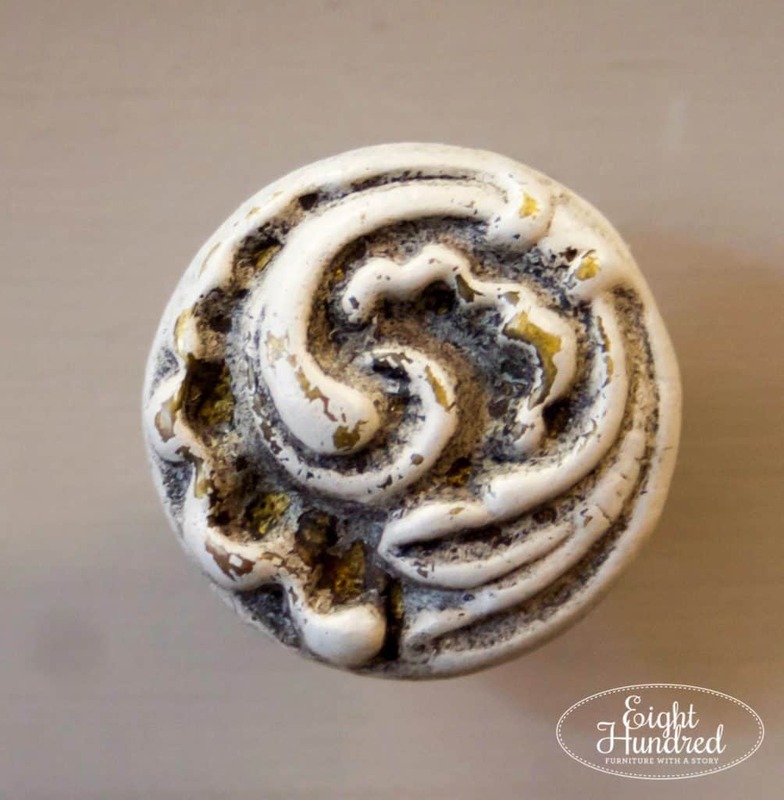 They can be round like this or rectangular shaped. 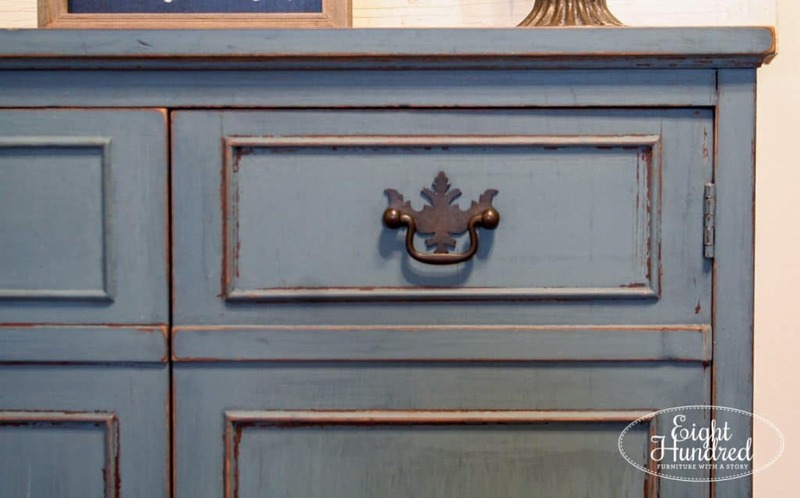 Some older pieces come with their own carved wood handles, like these from my Tricycle dresser. 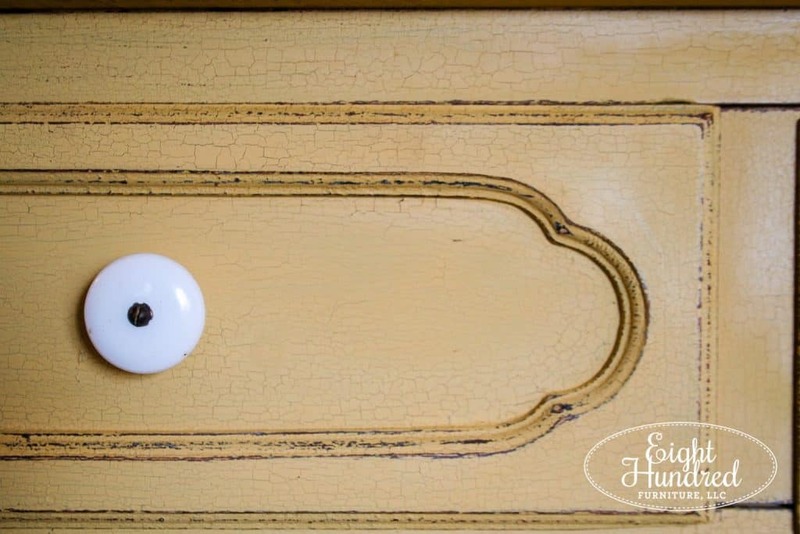 This style of handle is found on Victorian Eastlake pieces. 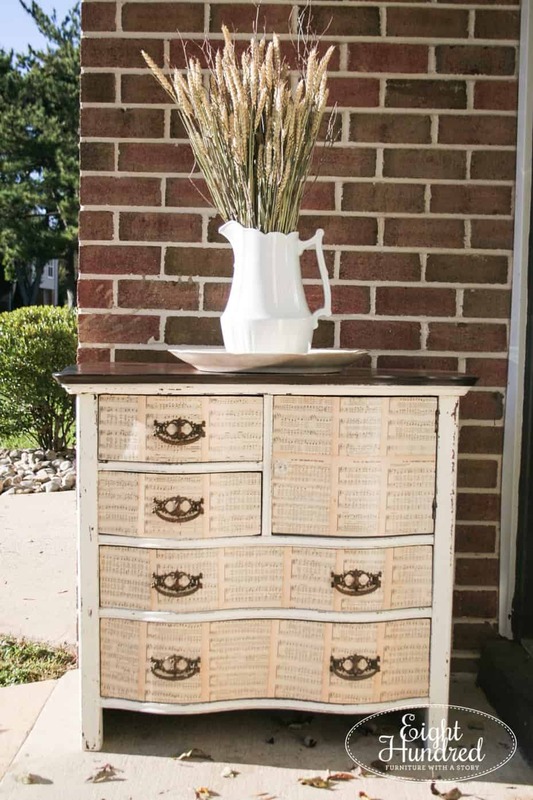 They are usually ornate, intricate, and have a few components – the backplate, the handle, and the two posts. They all assemble together to create a gorgeous handle. 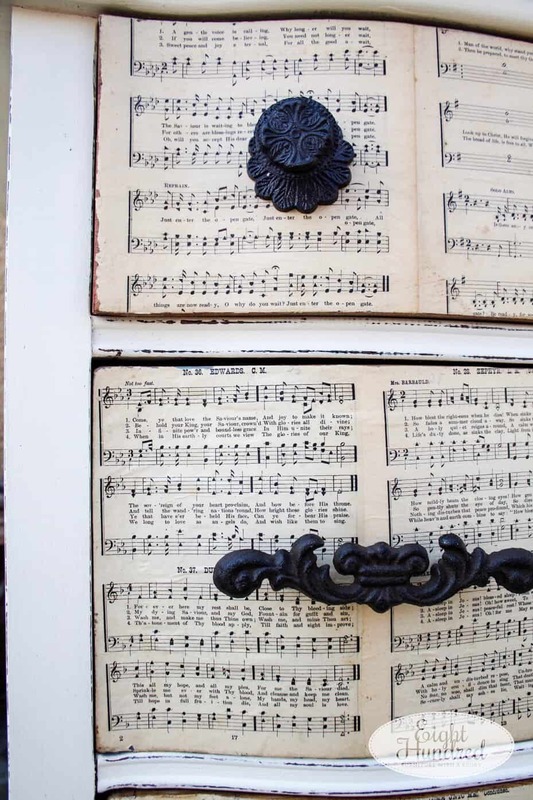 This one came from my sheet music washstand. Here’s another example from my Marzipan trunk. 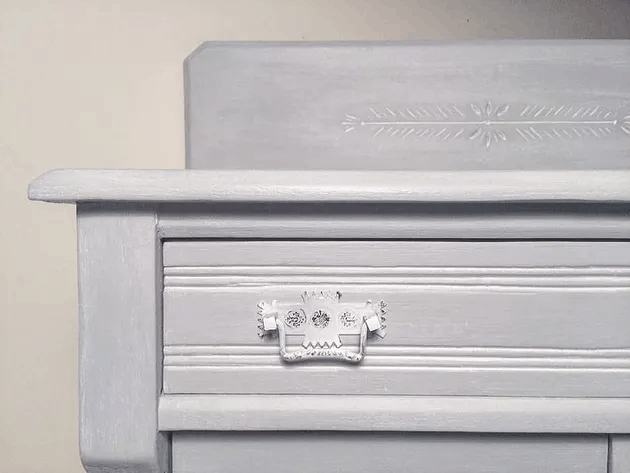 Victorian Eastlake handles can be square too, like these from my Aged Gray washstand. 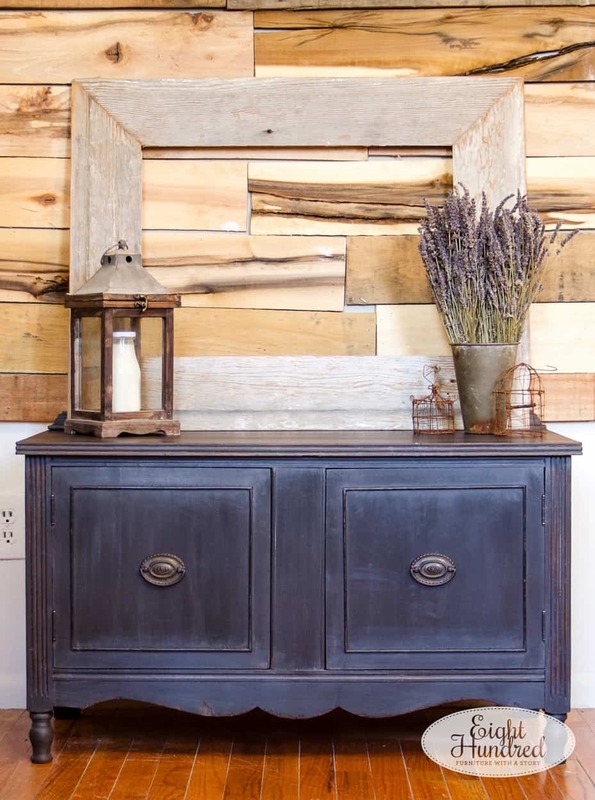 There are also cast iron knobs and handles to choose from. They give an old world feel, like these from my other sheet music piece. 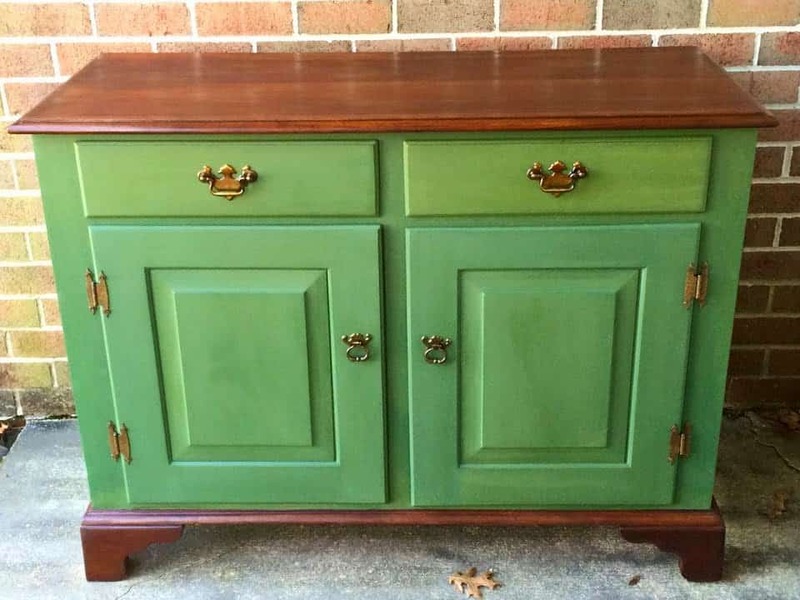 This one was a dresser. 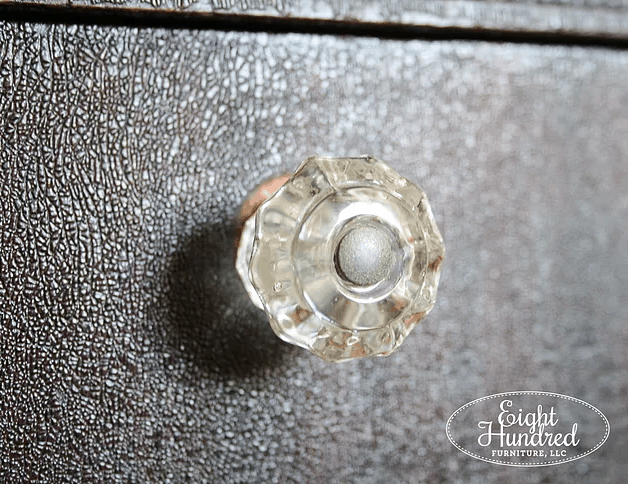 My personal favorite are antique glass knobs. They come in all different sizes and shapes, but I absolutely LOVE them! 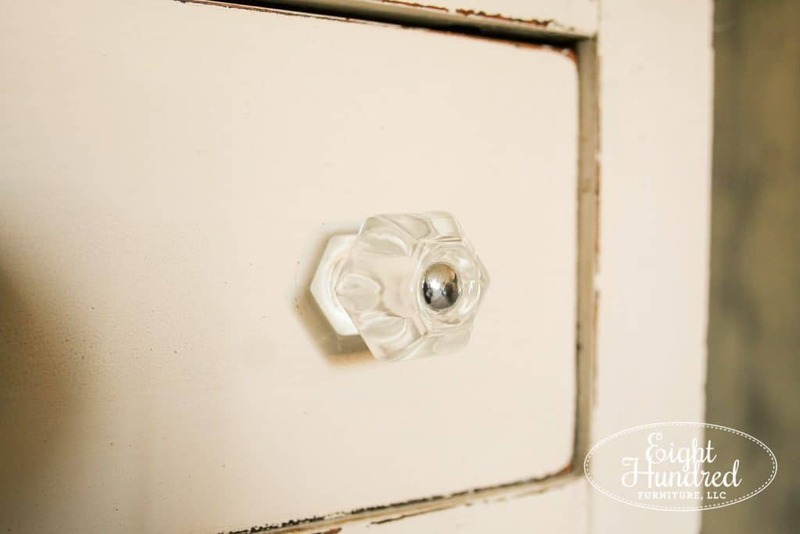 They have 2 parts – the pin in the middle and the glass knob itself. 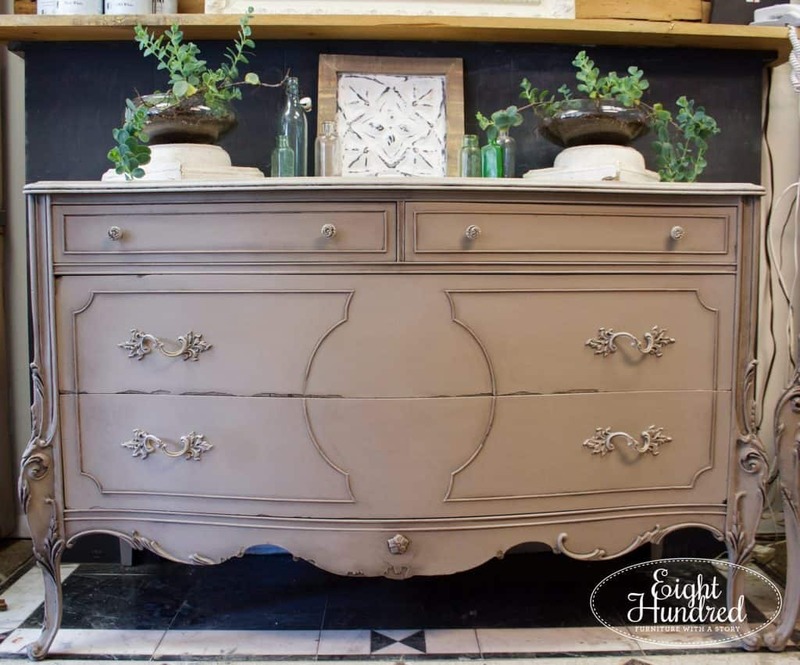 Then there’s Chippendale style handles. These are probably my least favorite type of hardware. I don’t know what it is, but they just don’t do it for me. They do look pretty on the right piece though, so I don’t always swap them out. 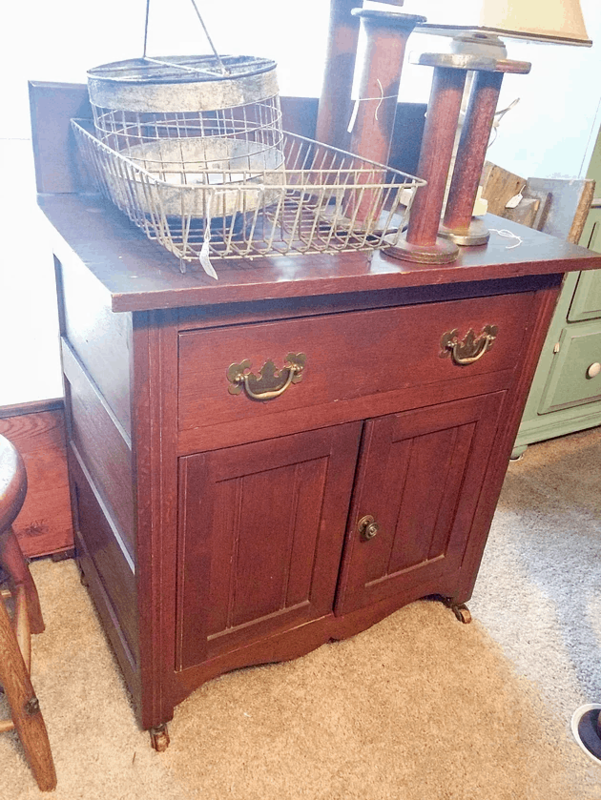 Here’s a wider pair on this wood washstand. And one last pair on my Boxwood cabinet. Maybe it’s the brass? I don’t know. I just can’t get on board with Chippendale. 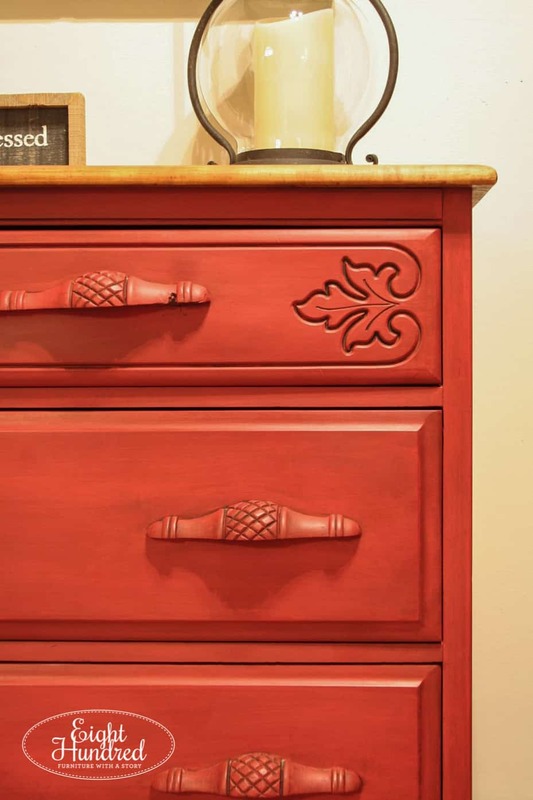 My mahogany dresser has federal/Hepplewhite style handles. These tend to be oval in shape, have some sort of decoration in the middle, and a handle that doesn’t dip below the backplate. 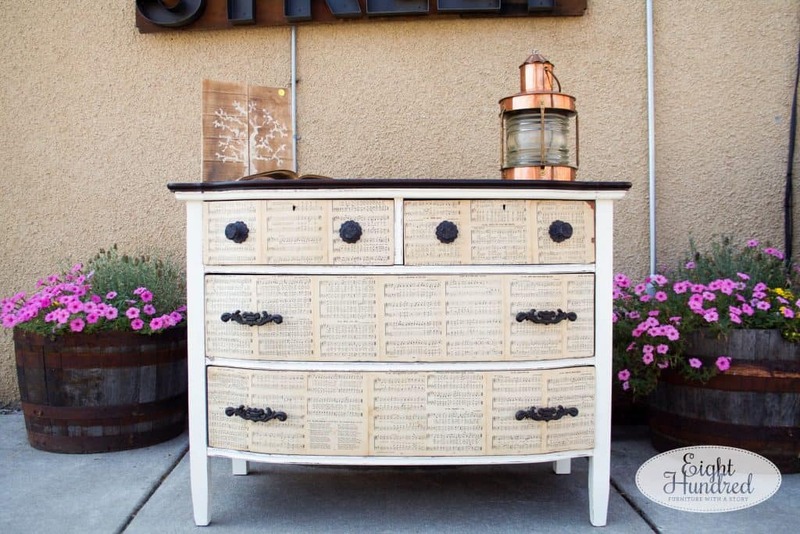 I absolutely loved this coco dresser, including the hardware. 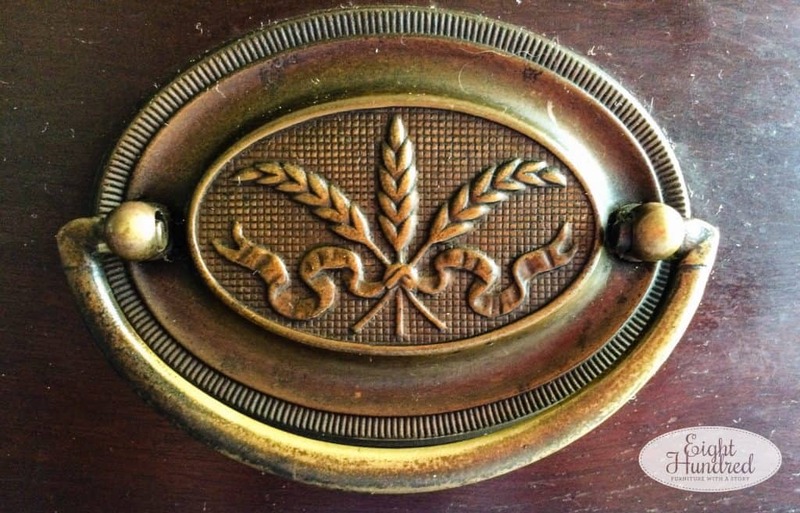 The handles had wheat stems on them and were brass originally. I spray painted them with oil rubbed bronze spray paint. 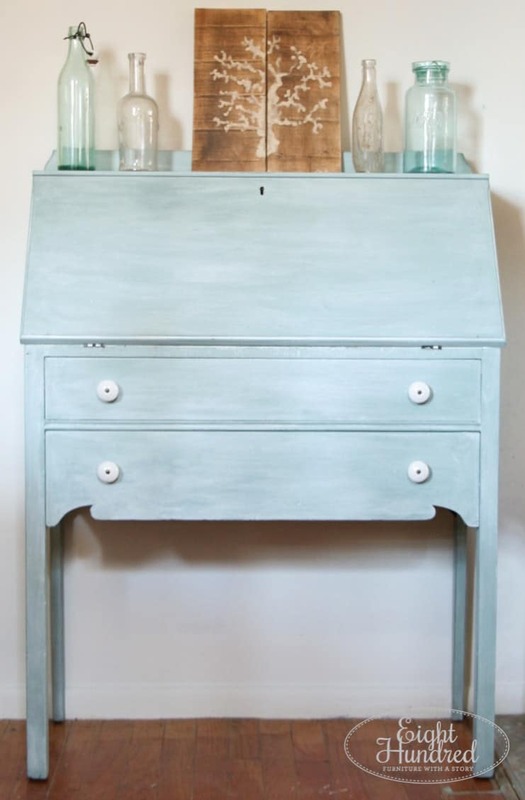 Here’s another example of Hepplewhite hardware on a small cabinet I painted in Graphite Chalk Paint®. 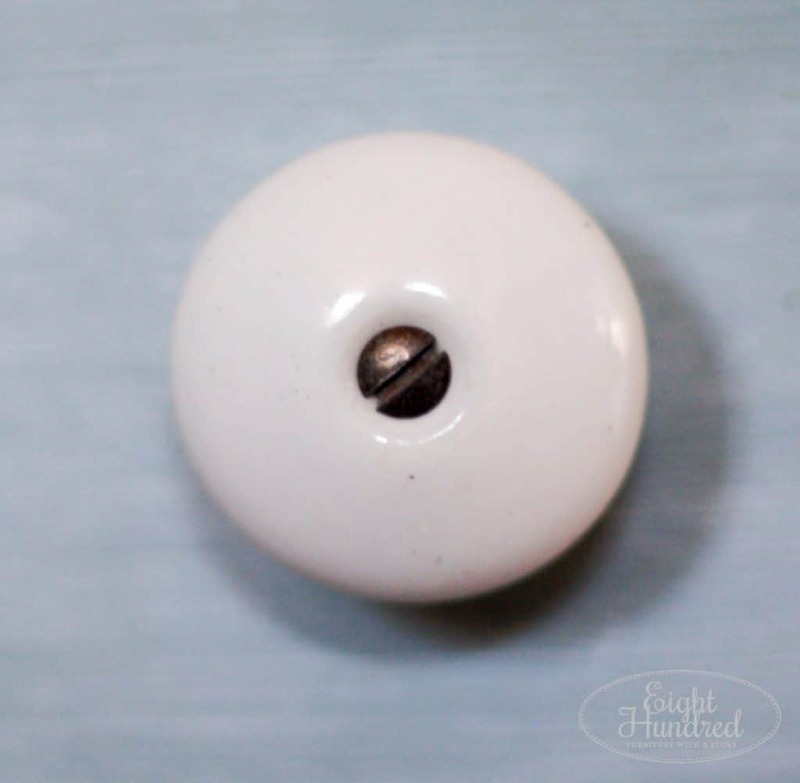 These knobs are more modern. They can be glass, resin, or plastic. They have ascalloped design and come in all sorts of colors and patterns. 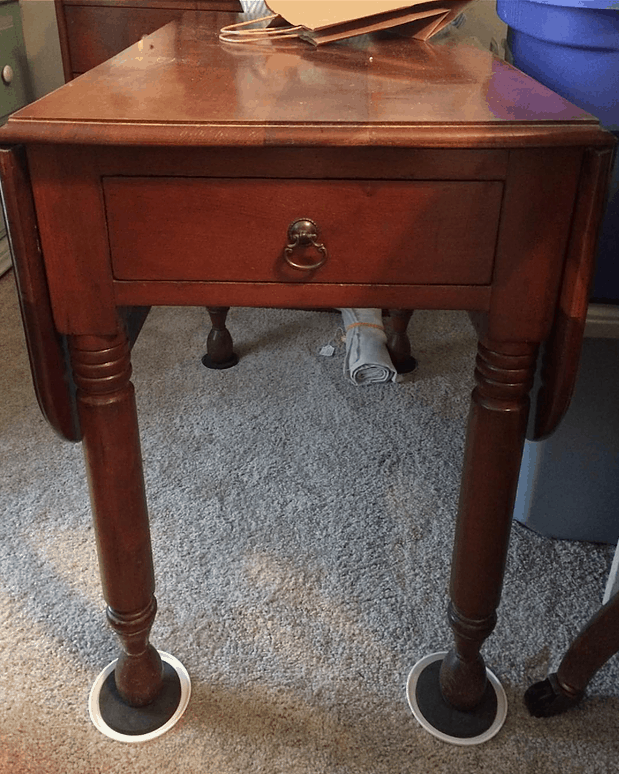 This Duck Egg writing desk has vintage porcelain knobs. They have a round disc made of porcelain and a screw that fits in the middle. They’re a great way to add old flair. 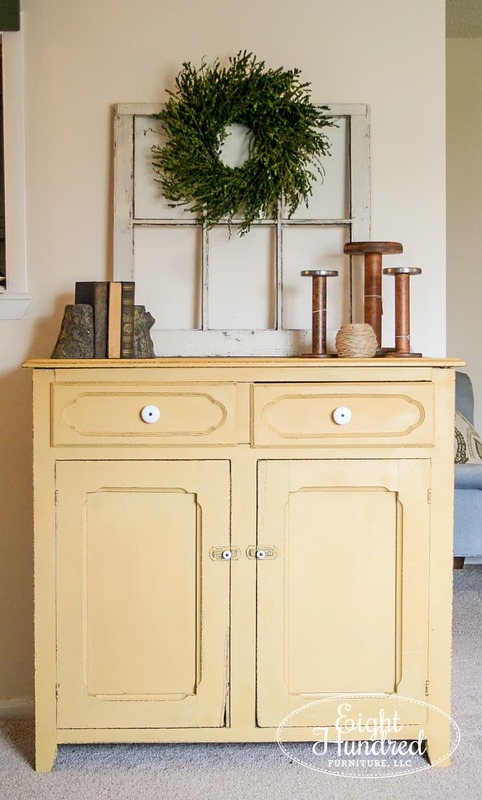 Here’s a different set on my Mustard Seed Yellow jelly cupboard. 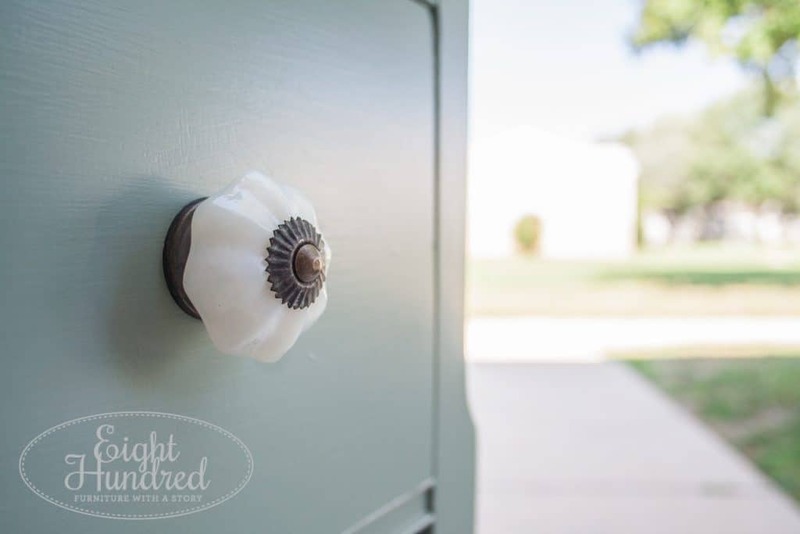 Aren’t these latches just the cutest? 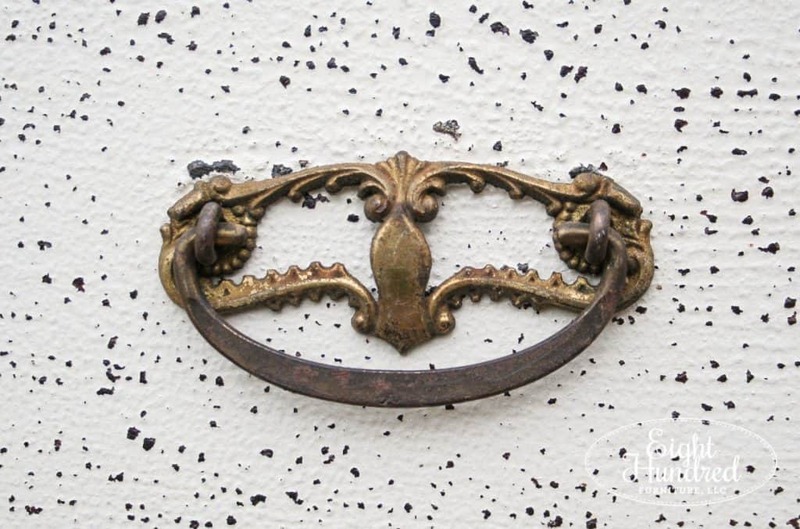 And then there’s French provincial style hardware. 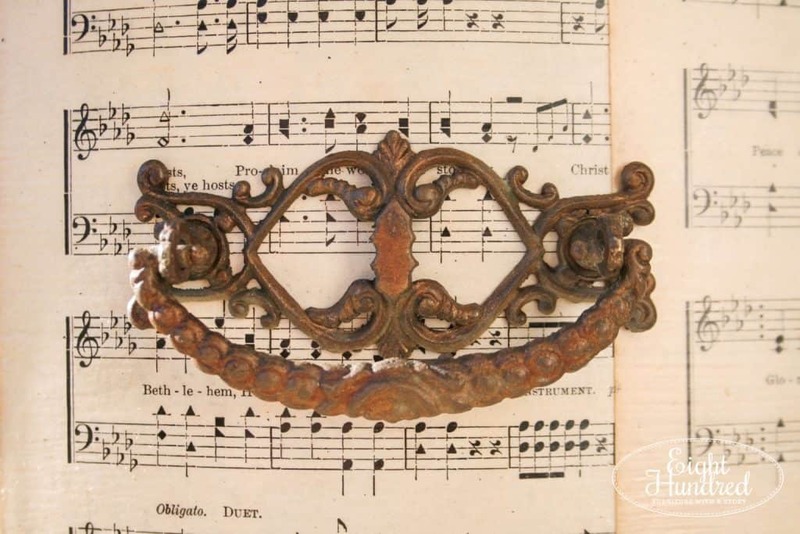 This style tends to be ornate, curved, and has leaf or curls on either end. This handle was quite unique, as it had an “S” shape. Usually they have a “U” shape to them. 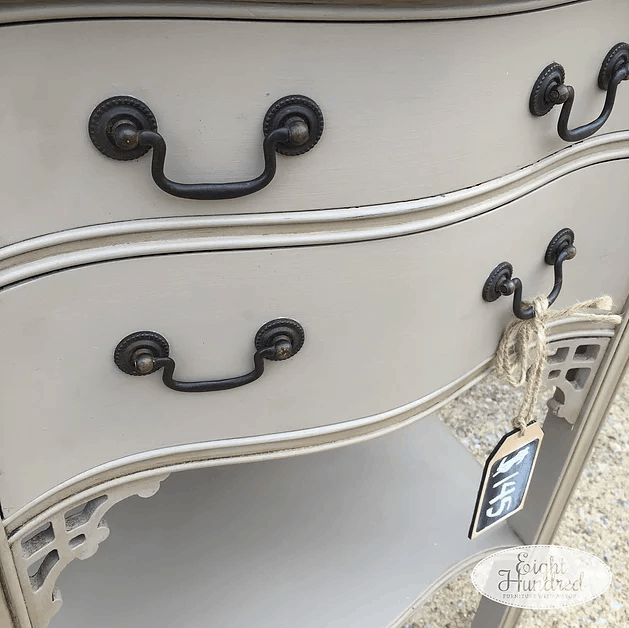 These two came from my French Linen dresser. These swan neck bail pulls curve out towards the bottom, like the curve of a swan’s neck. 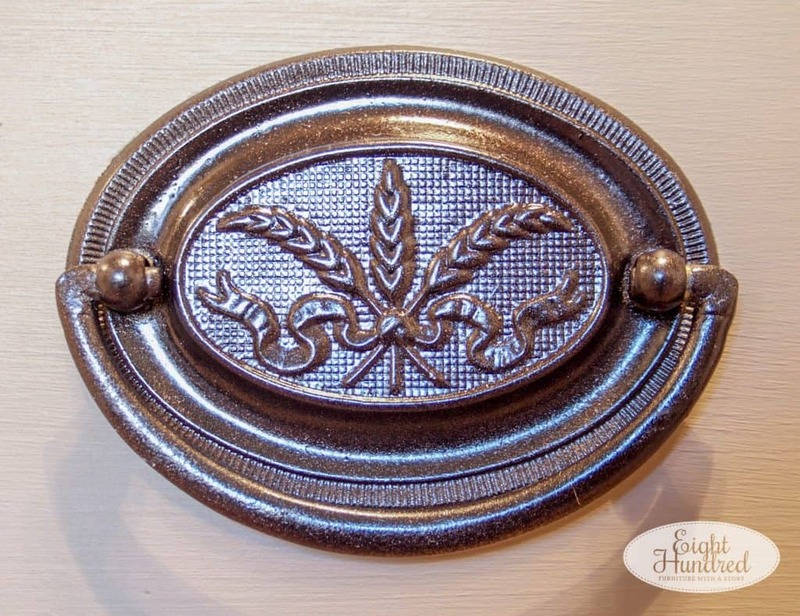 They hook into the medallions and screw into the back of your drawer or door. They are simple and elegant. Here’s an older example. 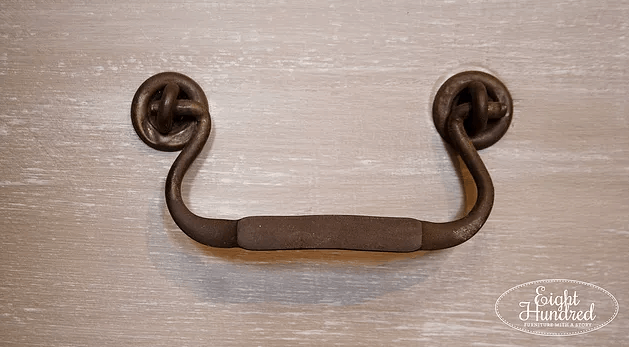 This swan neck pull fits into two hooks that have backplates. Again, simple and understated. 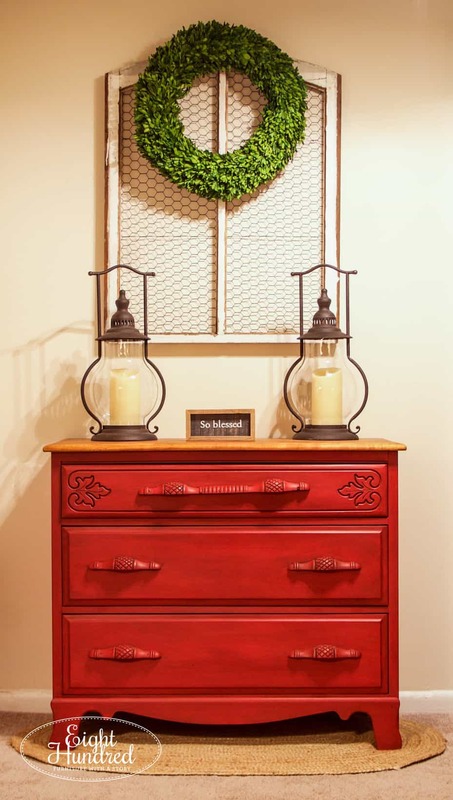 Hobby Lobby – Sometimes they run sales up to 50% off, so keep your eyes open for them! 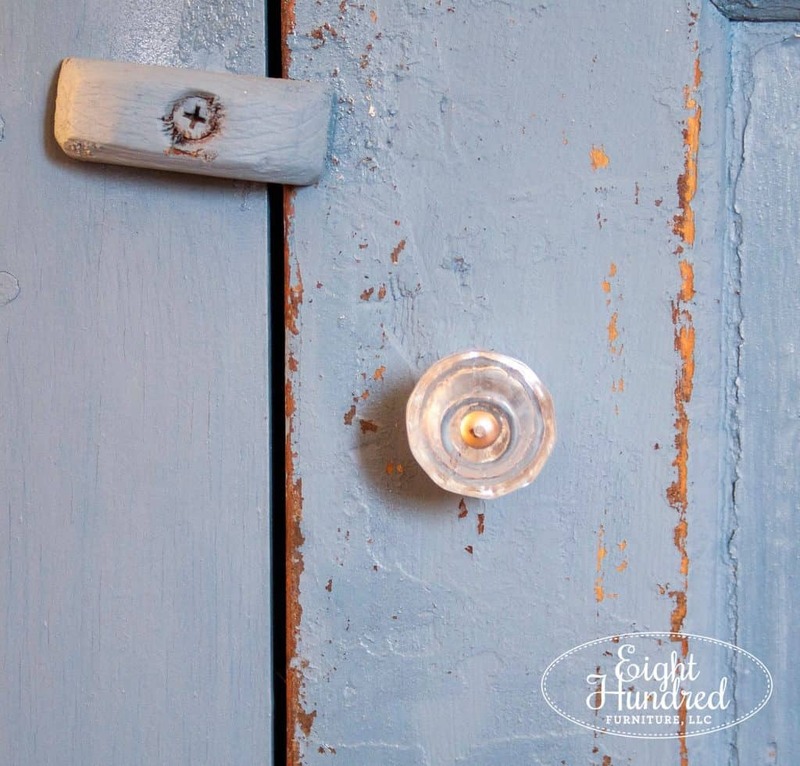 House of Antique Hardware – I go here when I’m looking for period-specific hardware, like Victorian Eastlake or Hoosier hardware. 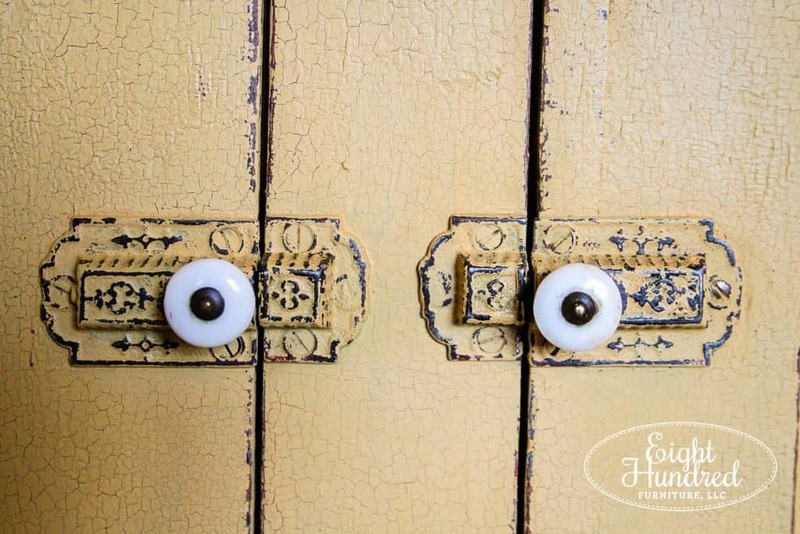 Van Dyke’s – Their selection is comparable to House of Antique Hardware. 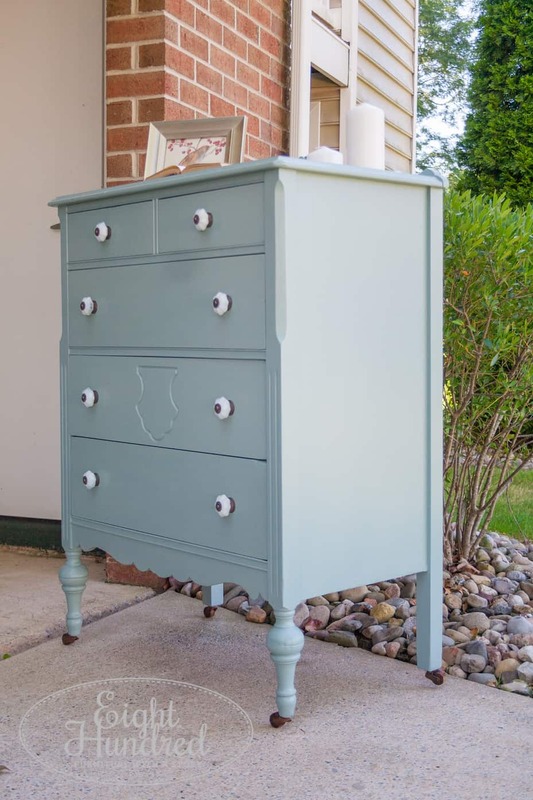 Etsy – You’d be surprised at their selection when it comes to vintage style hardware!